The easiest way to enter foreign markets is export. The fastest way to the sale goods and products for the entrepreneur is selling them through retail chains. To take the first steps to the Ukrainian retail market, become familiar with the market, know how to penetrate and on what conditions to cooperate with supermarkets, UkraineB2B offers Project-research individually to your product. For more information on how your company can start cooperation with Ukrainian supermarkets ... send an inquiry to [email protected] marked “Project-research”. With its large territory and a population of over 40 million people, Ukraine is a vast and attractive investment market for retail development here. The main result of the development of the retail market in Ukraine in recent years was to increase the role of modern organized trade. At the same time, the Ukrainian retail market is still not inherent trends of the other countries of Central and Eastern Europe. In particular, the consolidation of retailers and increased competition formats. According to a research conducted by GT Partners Ukraine in 2010, the average saturation of FMCG-areas in Ukraine is 90 m2 per thousand. Are the least saturated northern cities - Sumy (53 m2/1000 inhabitants) and Chernigov (59 m2/1000 inhabitants), and Lviv (62 m2/1000 inhabitants). The highest concentration of retail space there is in Rivne (179 m2/1000 inhabitants), and this regional center of much took the lead in comparison to other cities). In Kiev, the figure is 97 m2/1000 residents. Supermarket is the most popular and widely used format retailers in the population of Ukraine. In supermarkets, people leave about 42% of their funds intended for food. The share of hypermarkets is 18%, «convenience stores» and the cash & carries - 14%, discount stores - 12% in retail trade in Ukraine. Ukrainian food retail market is difficult to name a highly consolidated. By results of 2010, the total share of the 20 largest retailers in Ukraine amounted to only 26%, while the share of the top ten networks - 23%. For comparison, in Hungary the share of the ten largest networks of 88%, Slovenia - 99% in the UK top five retailers is 86%, in Germany - 65%. In Ukraine, more than 100 large and small food operators - this explains so much market fragmentation. At the same time, clearly defined leader, who for several years has the largest share of the retail trade of the country, a company Fozzy Group. 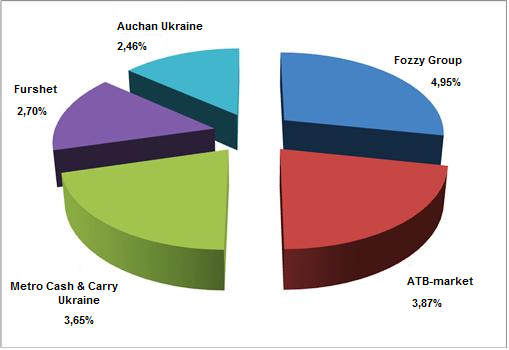 Due to its multi-format and plenty of shops share Fozzy Group in 2010 amounted to almost 5%. 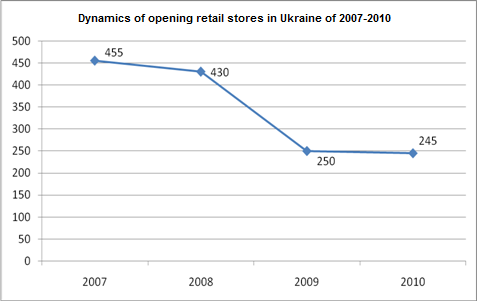 In 2010, food operators acting on the territory of Ukraine opened around 245 new stores. Note that in the previous year was open about 250 new outlets - indicates research conducted by GT Partners Ukraine. 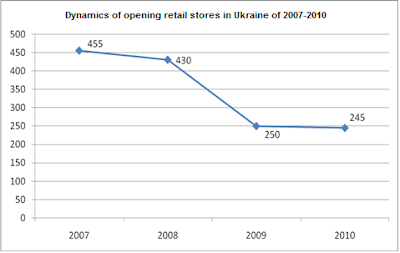 Also important is the fact that in 2010 the Ukrainian chain retailers have closed about 100 stores (excluding outlets that have moved to other owners). For comparison, in 2009, were closed 89 stores. Interesting that, from 75 food retailers operating in our country today, in 2010, managed to increase the number of its stores by 36 companies (in 2009 the figure was 32 companies). Eight commercial operators had to reduce the number of its outlets. In 2010, some networks have ceased to exist through the purchase by other retailers ("Roveks", "UCI"). The undisputed leader in the number of open stores in 2010, was the company "ATB-Market" (Dnepropetrovsk). Over the past year, the chain of discount stores replenished with 71 sales outlets. For that year, the main competitor of the network "ATB" in pursuit of shops continues company Fozzy Group (Kyiv), developing the network of supermarkets "Silpo", convenience shops "Fora" and hypermarkets "Fozzy." For the full year 2010 this retailer has opened 38 new retail sites. By regional coverage undisputed leaders among retailers is Fozzy Group, stores which operate in 23 regions of Ukraine and Crimea. "Furshet" supermarkets (Kiev) are situated in the 21 regions. Overall, at the end of 2010 in Ukraine there were 12 national grocery retailers - "ATB-Market», Fozzy Group, "Furshet", "Kviza Trade", "Eurotech", "EKO-market", "Nash Kray», SPAR, Metro Cash & Carry, "Kray", Billa and NOVUS. There are about 260 modern food stores, which represent 30 different retailers in Kiev. The most numerous are retailers of Fozzy Group – “Fora" (60 stores) and "Silpo" (40 stores), quite far away from them behind "EKO-Market" (20 supermarkets) and "Furshet" (19 supermarkets). Half of the capital's shops work in a format "supermarket", who "preaches" 15 chains. 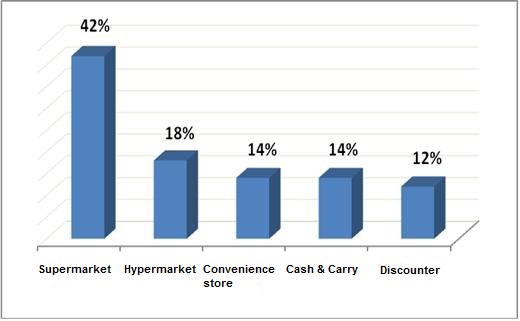 The second highest number of stores is the retail format of "convenience stores", which works for seven retailers. In the largest and most expensive format "hypermarket" in Kiev are 4 networks (Auchan, “Megamarket", "Karavan" and "Krajina"), which together represented 14 stores (though still some retailers, that use "supermarket", are composed of shops, in all respects suitable for hypermarkets). Dominance format stores "supermarket" - is all-Ukrainian tendency inherent not only to Kiev. In the medium term is expected to enhance the development of hypermarkets and discount stores in Kyiv and Ukraine as a whole.